A foot (pl. feet; abbreviation: ft; symbol: ′, the prime symbol) is a unit of length in the imperial and US customary systems of measurement. Since 1959, both units have been defined by international agreement as equivalent to 0.3048 meters exactly. In both systems, the foot comprises 12 inches and three feet compose a yard. Historically the "foot" was a part of many local systems of units, including the Greek, Roman, Chinese, French, and English systems. It varied in length from country to country, from city to city, and sometimes from trade to trade. Its length was usually between 250 mm and 335 mm and was generally, but not always, subdivided into 12 inches or 16 digits. The United States is the only industrialized nation that uses the international foot and the survey foot (a customary unit of length) in preference to the meter in its commercial, engineering, and standards activities. The foot is legally recognized in the United Kingdom; road signs must use imperial units, while its usage is widespread among the British public as a measurement of height. The foot is recognized as an alternative expression of length in Canada officially defined as a unit derived from the meter although both have partially metricated their units of measurement. The measurement of altitude in the aviation industry is one of the few areas where the foot is widely used outside the English-speaking world. Historically the human body has been used to provide the basis for units of length. The foot of a white male is typically about 15.3% of his height, giving a person of 160 cm (5 ft 3 in) a foot of 245 mm and one of 180 cm (5 ft 11 in) a foot of 275 mm. These figures are less than the foot used in most cities over time, suggesting that the "foot" was actually a synonym for a "shoe". Archeologists believe that the Egyptians and Mesopotamians preferred the cubit while the Romans and the Greeks preferred the foot. Under the Harappan linear measures, Indus cities during the Bronze Age used a foot of 13.2 in. (333.5 mm) and a cubit of 20.8 in. (528.3 mm). The Greek foot (ποὐς, pous) had a length of 1/600 of a stadion, one stadion being about 181.2 m, therefore a foot being at the time about 302 mm. Its exact size varied from city to city and could range as much as between 270 mm and 350 mm, but lengths used for temple construction appear to have been about 295 mm to 325 mm, the former being close to the size of the Roman foot. Originally both the Greeks and the Romans subdivided the foot into 16 digits, but in later years, the Romans also subdivided the foot into 12 unciae (from which both the English words "inch" and "ounce" are derived). After the fall of the Roman Empire, some Roman traditions were continued but others fell into disuse. In AD 790 Charlemagne attempted to reform the units of measure in his domains. His units of length were based on the toise and in particular the toise de l'Écritoire, the distance between the fingertips of the outstretched arms of a man. The toise has 6 pied (feet) each of 326.6 mm (12.86 in). The measures of Iron Age Britain are uncertain and proposed reconstructions such as the Megalithic Yard are controversial. Later Welsh legend credited Dyfnwal Moelmud with the establishment of their units, including a foot of 9 inches. The Belgic or North German foot of 335 mm (13.2 inches) was introduced to England either by the Belgic Celts during their invasions prior to the Romans or by the Anglo-Saxons in the 5th & 6th century. Roman units were introduced following their invasion in AD 43. The Roman foot had been previously standardized by Agrippa at around 296 mm or 11.65 inches. Following the Roman withdrawal and Saxon invasions, the Roman foot continued to be used in the construction crafts while the Belgic foot was used for land measurement. 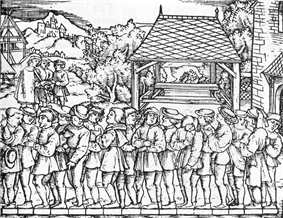 Both the Welsh and Belgic feet seem to have been based on multiples of the barleycorn, but by as early as 950 the English kings seem to have (ineffectually) ordered measures to be based upon an iron yardstick at Winchester and then London. Henry I was said to have ordered a new standard to be based upon his own arm and, by the c. 1300 Act concerning the Composition of Yards and Perches traditionally credited to Edward I or II, the statute foot was a different measure exactly 10⁄11 of the old foot. The barleycorn, inch, ell, and yard were likewise shrunk, while rods and furlongs remained the same. The ambiguity over the state of the mile was resolved by the 1593 Act against Converting of Great Houses into Several Tenements and for Restraint of Inmates and Inclosures in and near about the City of London and Westminster, which codified the statute mile as comprising 5,280 feet. The differences among the various physical standard yards around the world, revealed by increasingly powerful microscopes, eventually led to the 1959 adoption of the international foot defined in terms of the meter. The international yard and pound agreement of July 1959 defined the length of the international yard in the United States and countries of the Commonwealth of Nations as exactly 0.9144 meters. Consequently, the international foot is defined to be equal to exactly 0.3048 meters . This was 2 ppm shorter than the previous U.S definition and 1.7 ppm longer than the previous British definition. When the international foot was defined in 1959, a great deal of survey data was already available based on the former definitions, especially in the United States and in India. The small difference between the survey and the international foot would not be detectable on a survey of a small parcel, but becomes significant for mapping, or when the state plane coordinate system (SPCS) is used in the US, because the origin of the system may be hundreds of thousands of feet (hundreds of miles) from the point of interest. Hence the previous definitions continued to be used for surveying in the United States and India for many years, and are denoted survey feet to distinguish them from the international foot. The United Kingdom was unaffected by this problem, as the retriangulation of Great Britain (1936–62) had been done in meters. In preparation for the adjustment of the North American Datum of 1983, 31 states enacted legislation for the State Plane Coordinate System of 1983 (SPCS 83). All states defined SPCS 83 with metric parameters. Within the legislation, the U.S. Survey Foot was specified in 11 states and the International Foot was specified in 6 states. In all other states the meter is the only referenced unit of measure in the SPCS 83 legislation. The remaining 19 states do not yet have any legislation concerning SPCS 83. Since then, 42 states have abandoned the non-metric versions of SPCS 83: 7 states continue to keep location data in survey feet as well as in meters, while one state keeps data in international feet as well as in meters. State legislation is also important for determining the conversion factor to be used for everyday land surveying and real estate transactions, although the difference (2 ppm) is of no practical significance given the precision of normal surveying measurements over short distances (usually much less than a mile). 24 states have legislated that surveying measures should be based on the U.S. survey foot, 8 have legislated that they be made on the basis of the international foot, and 18 have not specified the conversion factor from metric units. The Indian survey foot is defined as exactly 6999304799600000000♠0.3047996 m, presumably derived from a measurement of the previous Indian standard of the yard. The current National Topographic Database of the Survey of India is based on the metric WGS-84 datum, which is also used by the Global Positioning System. In the United States, the foot was defined as 12 inches, with the inch being defined by the Mendenhall Order of 1893 by 39.37 inches = 1 m. In Imperial units, the foot was defined as 1⁄3 yard, with the yard being realized as a physical standard (separate from the standard meter). The yard standards of the different Commonwealth countries were periodically compared with one another. The value of the United Kingdom primary standard of the yard was determined in terms of the meter by the National Physical Laboratory in 1964 as 6999914396900000000♠0.9143969 m, implying a pre-1959 foot in the UK of 6999304799000000000♠0.3047990 m.
In 1799 the meter became the official unit of length in France. This was not fully enforced, and in 1812 Napoleon introduced the system of mesures usuelles which restored the traditional French measurements in the retail trade, but redefined them in terms of metric units. The foot, or pied metrique, was defined as one third of a meter. This unit continued in use until 1837. In Hesse, the Fuß (foot) was redefined as 25 cm. In Baden, the Fuß was redefined as 30 cm. In the Palatinate, the Fuß was redefined as being 331⁄3 cm (as in France). Many of these standards were peculiar to a particular city, especially in Germany (which, before German Unification in 1871, consisted of many kingdoms, principalities, free cities and so on). In many cases the length of the unit was not uniquely fixed: for example, the English foot was stated as 11 pouces 2.6 lignes (French inches and lines) by Picard, 11 pouces 3.11 lignes by Maskelyne and 11 pouces 3 lignes by D'Alembert. Most of the various feet in this list ceased to be used when the countries adopted the metric system. The Netherlands and modern Belgium adopted the metric system in 1817, having used the mesures usuelles under Napoleon and the newly formed German Empire adopted the metric system in 1871. The palm (typically 200 mm to 280 mm) was used in many Mediterranean cities instead of the foot. Horace Doursther, whose reference was published in Belgium which had the smallest foot measurements, grouped both units together, while J.F.G. Palaiseau devoted three chapters to units of length: one for linear measures (palms and feet), one for cloth measures (ells) and one for distances traveled (miles and leagues). In the table below, arbitrary cut-off points of 270 mm and 350 mm have been chosen. 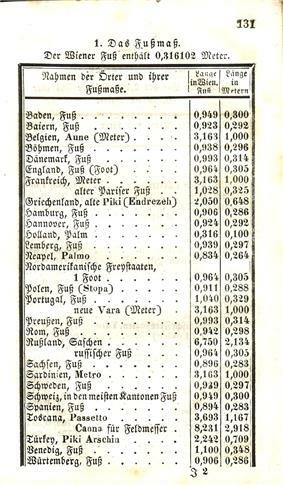 Darmstadt Germany Fuß 287.6 Until 1818, thereafter the Hessen "metric foot"
South Africa South Africa Cape foot 314.858 Originally equal to the Rijnland foot; redefined as 1.033 English feet in 1859. ^ Kelly, Jon (21 December 2011). "Will British people ever think in metric?". BBC. ^ Alder, Ken (2002). The Measure of all Things—The Seven-Year-Odyssey that Transformed the World. London: Abacus. ^ Weights and Measures Act, accessed January 2012, Act current to 2012-01-18. Basis for units of measurement 4. (1) All units of measurement used in Canada shall be determined on the basis of the International System of Units established by the General Conference of Weights and Measures. (...) Canadian units (5) The Canadian units of measurement are as set out and defined in Schedule II, and the symbols and abbreviations therefore are as added pursuant to subparagraph 6(1)(b)(ii). ^ Fessler, Daniel M; Haley, Kevin J; Lal, Roshni D (January–February 2005). "Sexual dimorphism in foot length proportionate to stature" (PDF). Annals of Human Biology, 32 (1): 44–59. ^ Sutherland, Elizabeth R (May 1957). "Feet and dates at Charlieu". Journal of the Society of Architectural Historians 16 (2). ^ Jacob Koebel (16th century). Geometrei. Von künstlichem Feldmessen und absehen (in German). ^ Great Britain (1762). The statutes at large: from the Magna Charta, to the end of the eleventh Parliament of Great Britain, anno 1761 (continued to 1807). The statutes at large 1. Printed by J. Bentham. p. 400. Retrieved November 30, 2011. ^ "On what basis is one inch exactly equal to 25.4 mm? Has the imperial inch been adjusted to give this exact fit and if so when?". ^ National Geodetic Survey (January 1991), Policy of the National Geodetic Survey Concerning Units of Measure for the State Plane Coordinate System of 1983. ^ Survey of India, "National Map Policy – 2005". ^ See, for example, Report on the Comparisons of the Parliamentary Copies of the Imperial Standards with the Imperial Standard Yard and the Imperial Standard Pound and with each other during the Years 1947 to 1948 (H.M.S.O., London, 1950). Report on the Comparisons of the Parliamentary Copies of the Imperial Standards with each other during the Year 1957 (H.M.S.O., London, 1958). ^ Denis Février. "Un historique du mètre" (in French). Ministère de l'Economie, des Finances et de l'Industrie. Retrieved March 10, 2011. ^ a b c d e f g h i j k l m "Amtliche Maßeinheiten in Europa 1842" [Official measures in Europe 1842] (in German). Retrieved September 22, 2012. ^ a b c d e d' Anville, Jean Baptiste Bourguignon (1769). ]Treatise of ancient and modern measures of distance [Traité des mesures itinéraires anciennes et modernes (in French). Paris: de l'Imprimerie Royale. Retrieved October 24, 2011. ^ Palaiseau, JFG (October 1816). Métrologie universelle, ancienne et moderne: ou rapport des poids et mesures des empires, royaumes, duchés et principautés des quatre parties du monde. Bordeaux. Retrieved October 30, 2011. ^ a b c d e f g h Jacob de Gelder (1824). ]Introduction to Numeracy [Allereerste Gronden der Cijferkunst (in Dutch). 's-Gravenhage (The Hague) and Amsterdam: de Gebroeders van Cleef. pp. 163–176. Retrieved March 2, 2011. ^ a b c d e f g h i Doursther, Horace (1840). Dictionnaire universel des poids et mesures anciens et modernes. Bruxelles: M. Hayez. pp. 402–418. Retrieved October 25, 2011. ^ a b c d e Noback, Christian; Noback, Friedrich Eduard (1851). ]Comprehensive pocketbook of money, weights and measures for all counties and trading centres [Vollständiges tasehenbuch der Münz-, Maass- und Gewichts-Verhältnisse etc. aller Länder und Handelsplätze (in German) I. Leipzig: F. А. Вrockhaus. Retrieved October 24, 2011. ^ a b Noback, Christian; Noback, Friedrich Eduard (1851). ]Comprehensive pocketbook of money, weights and measures for all counties and trading centres [Vollständiges tasehenbuch der Münz-, Maass- und Gewichts-Verhältnisse etc. aller Länder und Handelsplätze (in German) II. Leipzig: F. А. Вrockhaus. Retrieved October 24, 2011. ^ a b c d e f g h Bruhns, Carl (1881). new manual of logarithms to seven places of decimals. Leipzig: Bernhard Tauchnitz. p. 610. Retrieved October 26, 2011. ^ Jacob de Gelder (1824). ]Introduction to Numeracy [Allereerste Gronden der Cijferkunst (in Dutch). 's-Gravenhage (The Hague) and Amsterdam: de Gebroeders van Cleef. pp. 155–157. Retrieved March 2, 2011. ^ Andreas Dreizler; et al. (April 20, 2009). "Metrologie" (PDF) (in German). Technische Universität Darmstadt. Retrieved March 28, 2011. ^ a b c d e f g h "Maten en gewichten" [Weights and measures] (in Dutch). Vlaamse Vereniging voor Familiekunde (Flemish Association for Family History). 2011. Retrieved October 24, 2011. ^ a b c d e f g h i j k l Rose, Joshua (1900). Pattern Makers Assistant (9th ed.). New York: D. van Nostrand Co. p. 264. ^ "Les anciennes unités et leurs équivalences" [Old units and their equivalences] (in French). Le Cybergroupe Généalogique de Charente Poitevine. 2011. Retrieved February 25, 2011. ^ a b c d e Guilhiermoz, P (1913). "De l'équivalence des anciennes mesures. A propos d'une publication récente" [Values of ancient measures quoted in recent publications]. Bibliothèque de l'École des chartes (in French) 74: 267–328. ^ halbo, leif (July 21, 2005). "Mål, vekt og norsk selvstendighet" [Dimensions, weight and Norwegian independence]. Aftenposten. ^ Tomasz Zakiewicz (April 2005). "The Cape Geodetic Standards and Their Impact on Africa" (PDF). FIG, Cairo. Retrieved January 4, 2012. ^ "Scottish Weights and Measures: Distance and Area". Scottish Archive Network. Retrieved January 28, 2010.